The market is flooded with fresh, bright green peas. They so sweet and perfect! I have shelled and cleaned about 4-5 kgs of green peas, frozen them in sterilised Ziplock bags to last me for the entire year….more than enough for the two of us! I do this almost every year as I detest the flavour of the store bought frozen peas, they are quite tasteless. The stuffing is made with fresh, sweet green peas and some spices tasters tangy, earthy as it uses my home made Garam Masala along with loads of ginger…all the flavours of a perfect Northern winter! There is no onion or garlic in this recipe. The outer pastry is flaky and very crisp as its fried on slow flame…always fry your kachoris low and slow! They cook well and never turn limp and soggy. Equipment: a heavy bottom wok, a slotted ladle, measuring spoons/ cups, rolling board, rolling board, kitchen paper, a small pan, potato masher, mixing bowls. Take flour in a mixing bowl, season it with salt. Add ghee and rub it into the flour until the flour resembles bread crumbs. This ensures that the outer cover of the kachori is crisp and flaky. Next, add sufficient water to make a semi stiff dough. Cover the dough and set it aside to let it rest for a minimum of 30 mins. Mash the boiled potato and set it aside. Potato is used as a binder, if you wish you can avoid it too. In a pan, heat oil. Once it’s hot, add hing, cumin seeds and green chillies. Let them splatter around for a minute. Then add the grated ginger. Cook it for a minute. The washed and dried green peas go in next. Season with salt and cook the peas for a few minutes. Then add the turmeric, red chilli powder, coriander powder, Garam Masala powder. Mix well. Add the mashed potato and mix well with the spices and the peas. Cover and cook for 5-7 minutes or until the peas become mushy. Add the amchoor powder along with chopped coriander leaves next and mix well. Turn off the flame. Cover the pan with the ready stuffing for a few minutes. Then using a potato masher, mash the peas and potato mixtures well. Let some of the peas stay whole, while roughly mashing the others. That’s done. Divide the dough which was kept aside into 9 equal sized balls. (I could make 9, if you choose to make smaller Kachoris, you can easily make upto 12 kachoris with this much amount of dough). Flatten each ball of dough to a thickness 2-3 mm and diameter about 3″, add 2-3 tsp of the stuffing. Close the dough ball around stuffing tightly and secure the ends so that the stuffing doesn’t spill out while frying. Flatten out the kachori a bit using a rolling board and pin. Do the same with all the other 8 dough balls as well. Set them aside. Heat oil to fry in a heavy bottomed wok. Once it hot enough, drop 1-2 kachoris at a time and fry on low flame until golfden and crisp on all sides. Remove from oil and drain excess oil on kitchen papers. Fry them all and the serve these piping hot with sides of your choice. 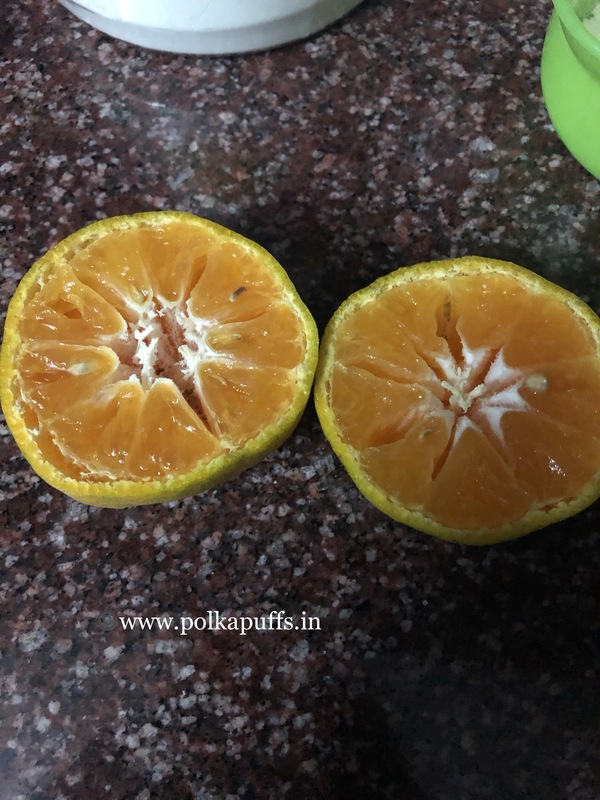 I am drooling all over again just as I was typing out this draft 😜 But, seriously, do try this one out soon …..so easy to make and very flavoursome!!! You will be making these again and again. Winters are the perfect season to devour everything that’s deep fried and spicy😋😋 I can never say no to anything that’s fried even though I keep promising myself to avoid it as far as possible. These Aloo ki Kachoris are so so delicious…even if I am saying this myself but you truly need to eat these to believe me! 👌🏼😀 They are crispy, flaky and the filling is absolutely lip smacking! Dont they look tempting….!? I served these for our Saturday brunch and my hubby couldn’t stop raving about them. I was moving a couple of inches aboveboard the ground for the next few hours 😂😂 The thing is has always enjoyed Aloo ki kachori made in one of the shops in some obscure lane in Kanpur….I’ve tasted that too on one of our trips there, I must confess that it was such a treat 😋 I couldn’t stop at one! So when my hubby wanted me to make some at home a few weeks ago, I asked my Mom for the recipe and kept my fingers crossed that he’d approve of them. I usually make Pyaaz ki Kachori at home for brunches so I knew I’d nail the outer crisp cover…it was the filling that I wished to perfect. I served them with every kachori’s favourite accompaniment Dubkimaar Aloo Tamatar ka Rassa and some kacchi kairi Wali chutney…will share the recipe today. Equipment: a heavy bottomed wok, rolling pin, rolling board, large mixing bowl, measuring cups/ spoons. In a large bowl, take maida, season with salt. Add the ghee and rub it with the mAida until it resembles bread crumbs. This makes the kachori crispy. Then add little water at a time and make a semi stiff dough. Cover the dough with a kitchen napkin and set aside for 20-30 mins. Mash potatoes, add salt, roasted cumin powder, amchur powder, hing, red chilli powder, chillies and coriander leaves. Mix well. Set it aside. Divide the dough in equal sized balls (I made 9). Roll these balls to a flat Roti like shape having a diameter of 3″ or so, stuff with the potato filling. Secure the ball well and flatter the kachori a bit using the rolling pin. Do the same for all the 9 dough balls. Now heat the oil in a wok til it’s hot enough to fry. Add 1-2 Kachoris at a time and fry them on low flame until golden and crisp on both sides. Don’t fry on high flame as the Kachoris won’t turn crisp. Wash and chop the coriander leaves. Add al, the ingredients in a blender jar and make the Chutney using water as needed. Store the Chutney in a porcelain or glass jar, it will stay fresh for 6-7 days. So the last from this Christmas is going to be these delicious, sinful Chocolate Truffles. I can go on eating them all in a go if I weren’t afraid of putting on a pound with each bite😜 nope….can’t take that risk. Making this recipe doesn’t call for any thermometer or any other fancy gadget. It’s just a bit of eyeballing the situation…and you’re all set. Obviously for that one needs to master the art of making the perfect ganache. 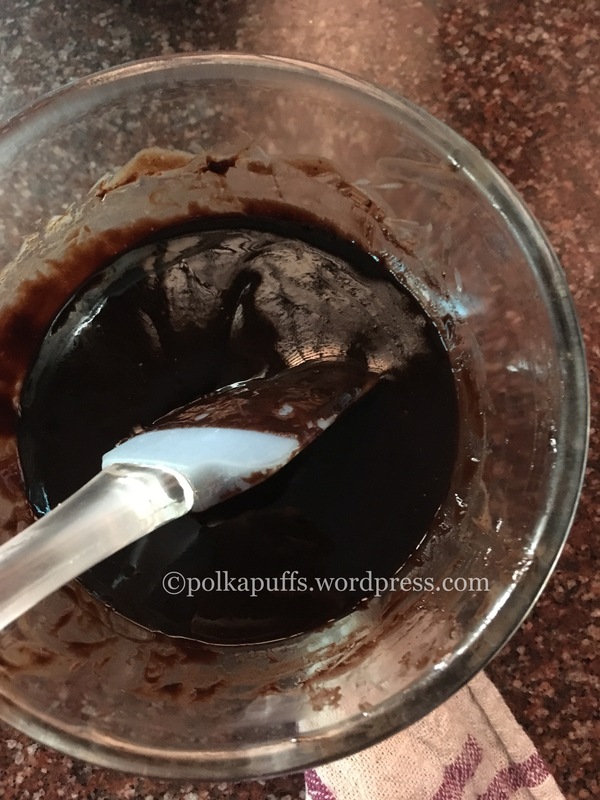 I will share exact recipe for the same in grams (use a weighing scale), if you follow the measurements correctly, you will end up with the most luscious and shiny ganache ever. 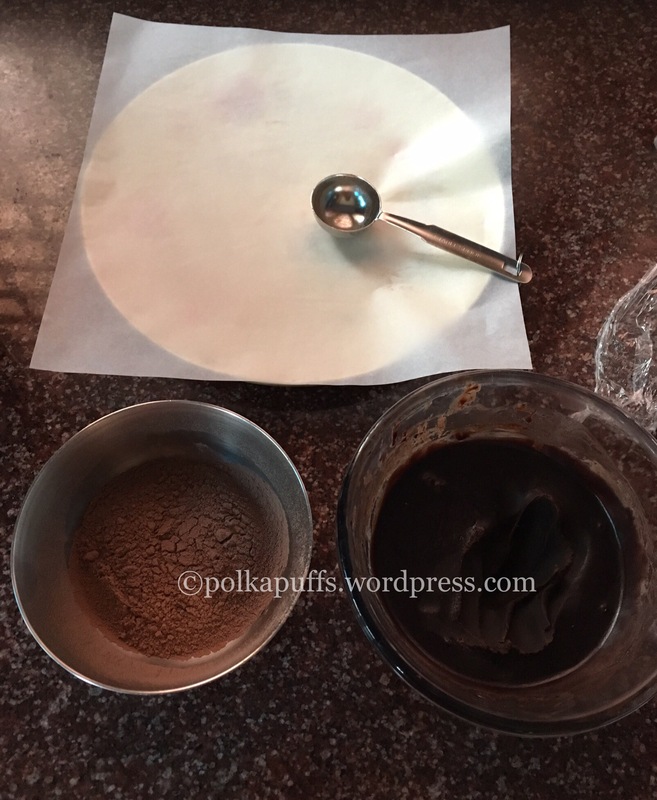 Either use this ganache to fill within a cake or to dress a cake. Make truffles if your like me, or simply pour over favourite Brownie and indulge your tastebuds! I prefer keeping them simple and hence just rolled these beauties in some good quality unsweetened cocoa powder just before serving. Here are a few variations you can use to decorate your truffles. Chocolate: This is a very common option, melt some Chocolate chips of a cooking chocolate bar, let it come to room temperature and then dip the set ganache balls in the chocolate and let them set for about 15 mins in the refrigerator. Nuts: I love the nut encrusted truffles. Crush any nuts of your choice in a bowl (I prefer pistachio for it’s beautiful green and pink hue) and coat the set ganache balls in the crushed nuts. They look pretty and add a whole new flavour dimension. Hazelnut or walnuts too make for an excellent choice. Now for what you can add within them, in terms of flavour. Liquor: Fruity liquor (raspberry, coconut, lemon, strawberry, etc) or even something like rum/ whiskey, etc can be added to the ganache mixture once it has cooled down a bit and just before you begin making the ganache balls. If you add the liquor when the ganache is too hot, the alcohol will evaporate and there won’t be much flavour left behind. Essence/ extract: Almond extract or the good old vanilla is always such a lovely flavour. 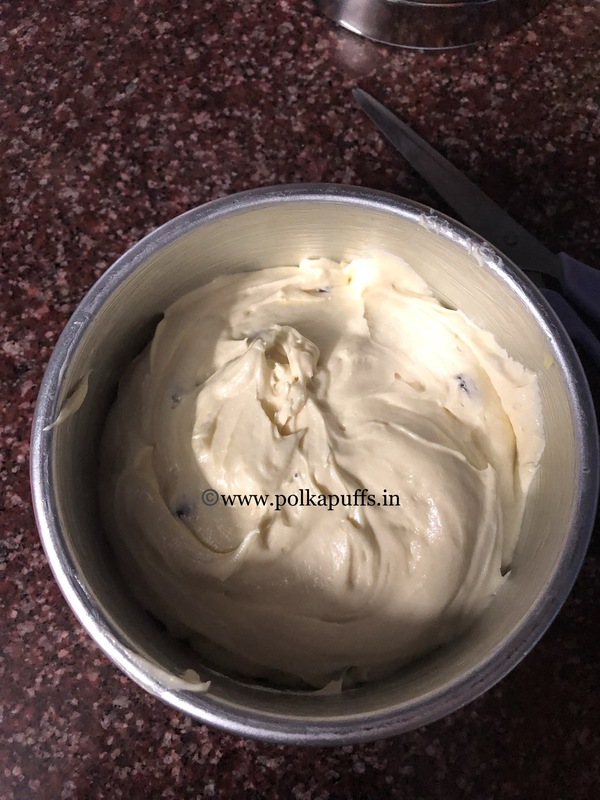 Let’s learn an easy and precise recipe…. Equipment: a saucepan, a heatproof bowl, parchment paper/ baking paper, a small scoop of a tablespoon, measuring spoons/ cups. Heat water in a sauce pan, once it’s boiling gently, place a heatproof bowl over the sauce pan in such a way that the bowl does not touch the water below (double boiler). Place chopped chocolate, cream and butter into the bowl and let these melt slowly. 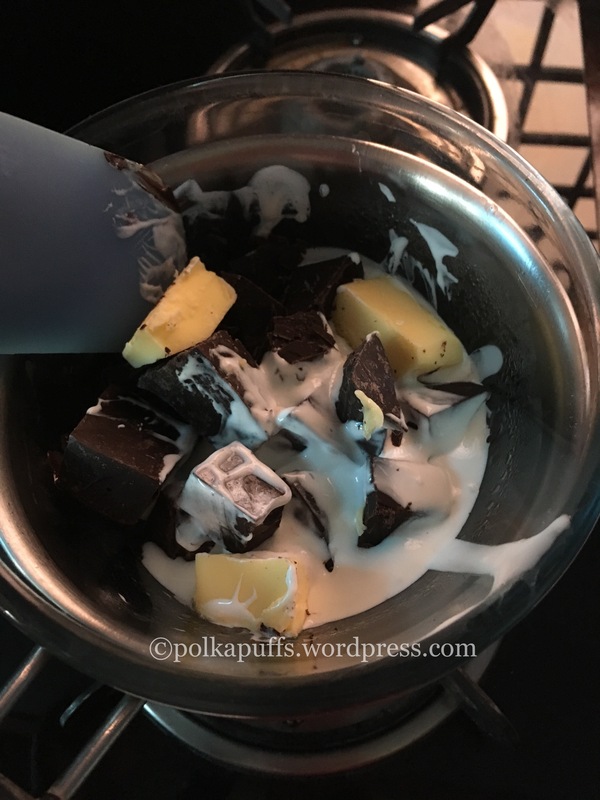 Once the chocolate has melted into the butter and the cream, take the bowl off the double boiler and gently mix everyt with a silicon spatula for a minute. Do not over mix. Once the mixture comes to room temperature, add vanilla extract, mix and refrigerate for two hours. If you refrigerated it for longer, then let the ganache become slightly soft before rolling it into balls. I used a tablespoon to measure the ganache and rolled them into balls and the quickly rolled every ball into the cocoa powder. Refrigerate until they need to be served/ packed. Make sure the ganache is not runny, it needs to be firm when being rolled into balls. Ensure you use a good quality cocoa powder as that adds much flavour. Alternately, roll in icing sugar if you wish to avoid cocoa. These are so tempting…it’s hard to resist really😜 I’d love these as Christmas gifts too….so I am sure so will your loved ones! 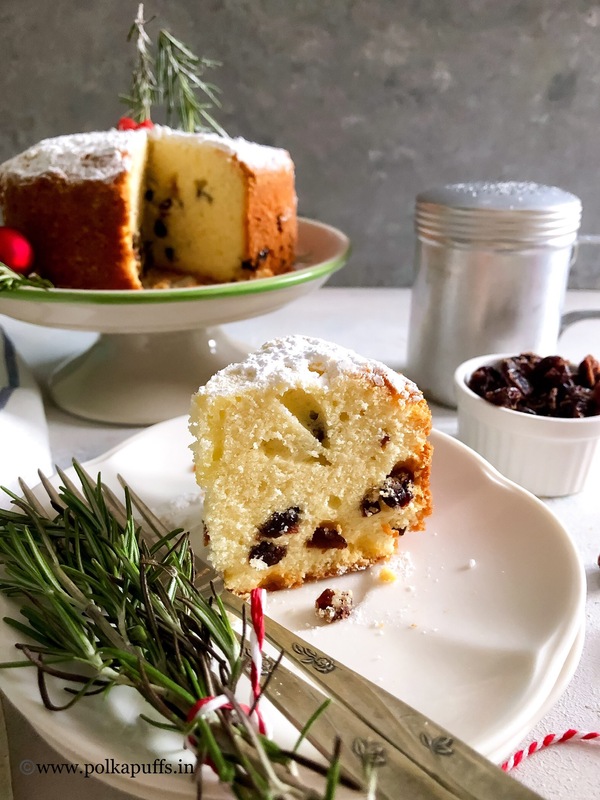 Spiced Orange and Cranberry Cake is moist from the orange juice and the splash of milk. It keeps fresh for almost a week if stored correctly, wrapped in some cling inside an airtight container. This cake also makes for the best sort of edible gift for friends and family. Minimal efforts, for one thing and it is so pretty! 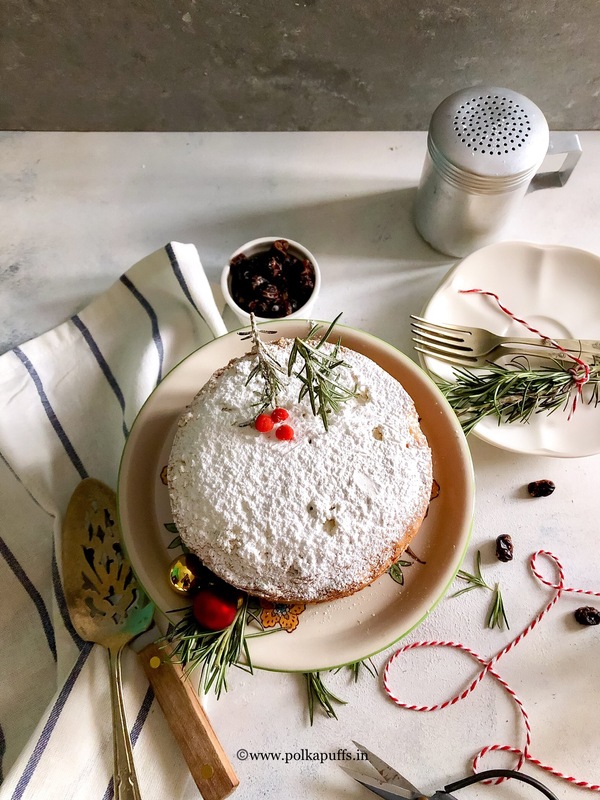 I mean, you can make it look so Christmassy ;p All I did was dust the cake with some icing sugar for the fresh snowy look and took it from there as to how I wanted it to sit on my table 🙂 Easy, peasy and breezy! Spiced Orange and Cranberry Cake has the most beautiful texture on slicing it down. This cake holds it shape and that makes it easy for the cake to travel! Besides, I love a slightly dense cake because the crumbs just make a big mess and a cake which is dry and crumbly is not a cake that I personally like! 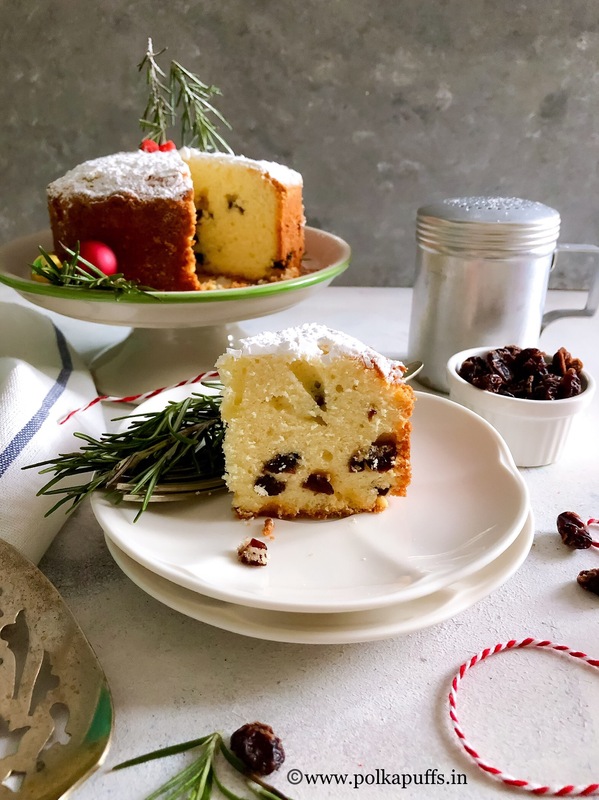 Spiced Orange and Cranberry Cake is to be baked low and slow. That is how you end up with that beautiful brown crust on the cake. However the top may dome a tiny bit, you can slice that right off so the you get a lovely flat top. You can then decorate the cake as you like or keep it plain. Preheat the oven @180’c. Line the base of the tin with parchment paper/ baking paper and grease and dust the sides well. In a medium size bowl, sieve together the flour, ground nutmeg, ground cloves, ground cinnamon, baking powder and baking soda. Set it aside. Dust the cranberries with some flour and set them aside. Next, in a large mixing bowl, whisk together the butter and powdered sugar until light and fluffy. I used an electric whisk and it took me about 3-4 mins of whisking. Now add one egg at a time and whisk the butter and sugar mixture with the eggs until light and fluffy once again. 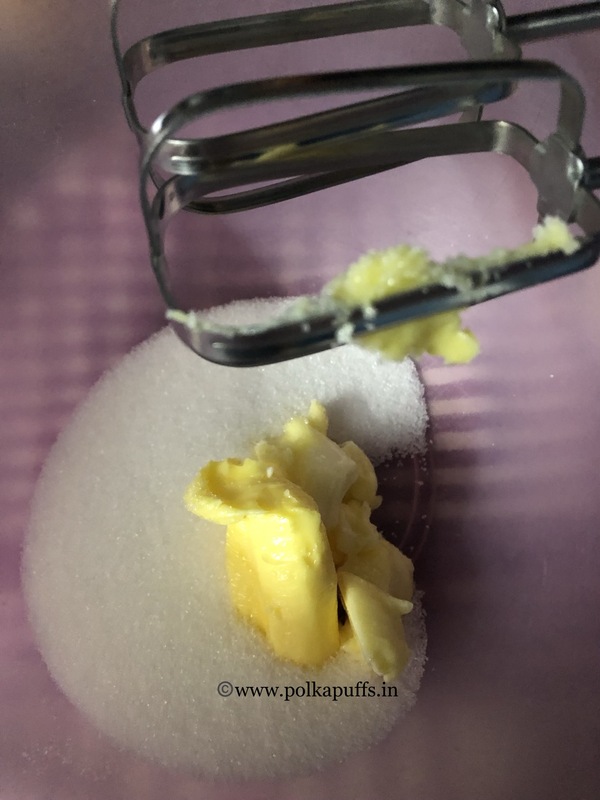 Now, add the sieved flour mixture and milk in the egg-butter-sugar mixture alternately and fold the mixture with a silicon spatula. Do not mix with a heavy hand else all the air whisked in the eggs will escape. Then add the orange juice and the cranberries. Mix well. 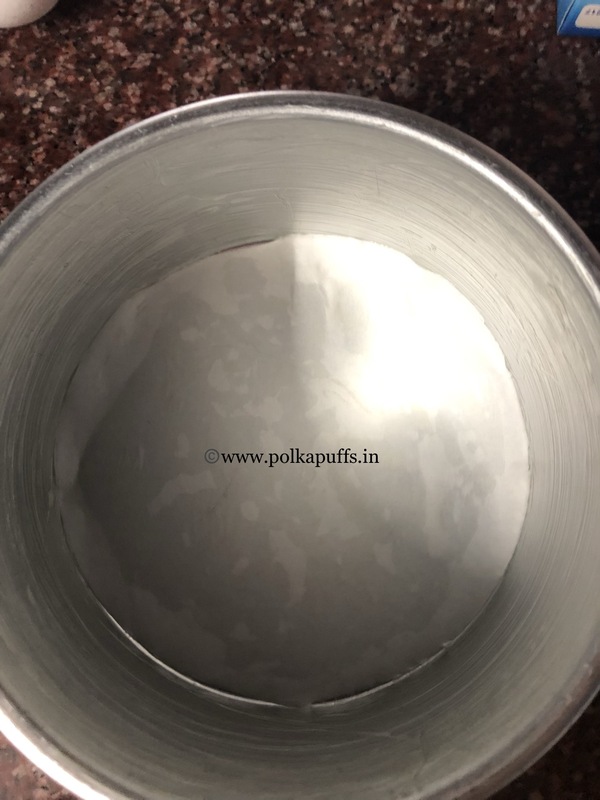 Pour the batter in the tin and bake @ 170’c using the lower heating rods/ coil for 60 mins approximately or until a skewer inserted in the center of the cake comes out clean or with a few moist crumbs. Note that every oven works differently so keep an eye on the temperature and the duration of the bake. I prefer baking my cakes low and slow, low temperature takes longer to bake the cake but ensures it rises well without any cracks on the top. Once the cake is baked, remove it from the oven and cool it on a rack for 15 mins in the tin, then unmould it and cool it for a further 30 mins. Dust the top with some icing sugar. Slice it and serve. 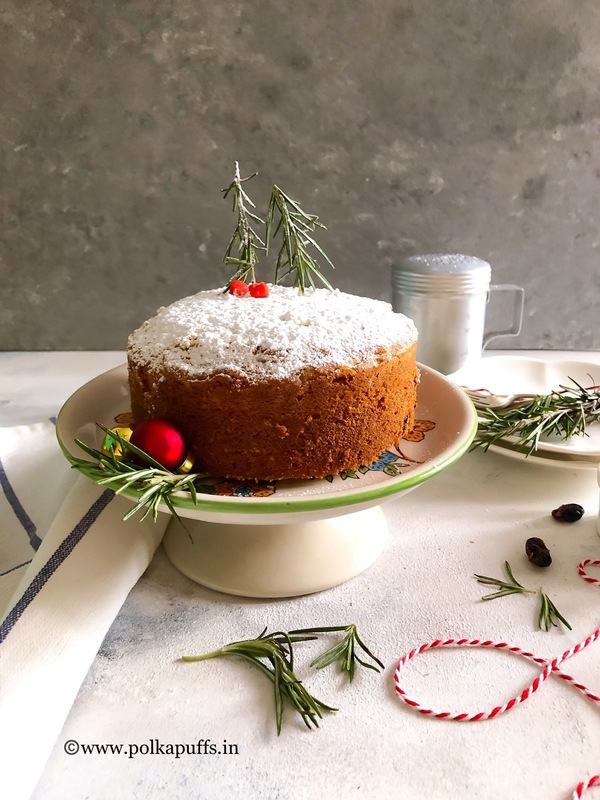 Spiced Orange and Cranberry Cake is so warm from the mild spices, a bit tart from the juicy cranberries and has a citrusy aroma from the oranges! 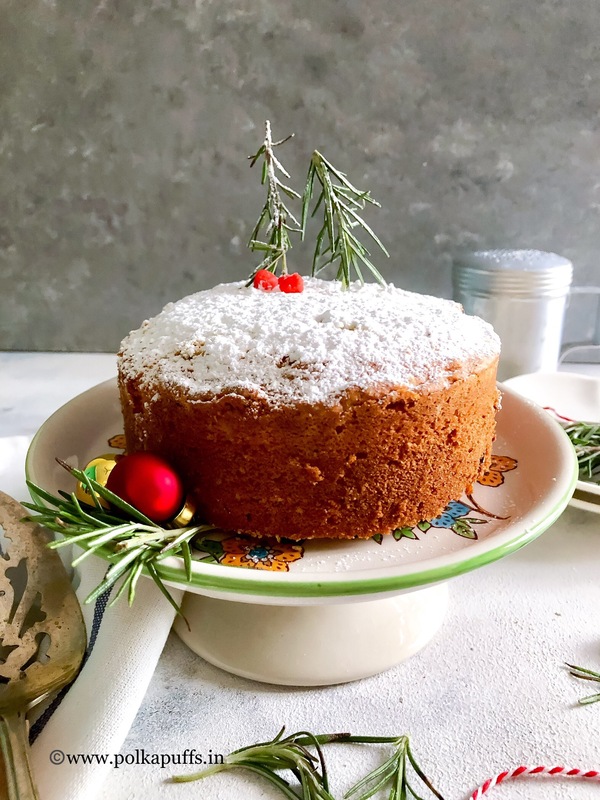 These flavors come together so beautifully in this cake, making it the most perfect bake for the Holiday season! Preheat the oven @180'c. Line the base of the tin with parchment paper/ baking paper and grease and dust the sides well. In a medium size bowl, seive together the flour, ground nutmeg, ground cloves, ground cinnamon, baking powder and baking soda. Set it aside. Dust the cranberries with some flour and set them aside. Now, add the seived flour mixture and milk in the egg-butter-sugar mixture alternately and fold the mixture with a silicon spatula. Do not mix with a heavy hand else all the air whisked in the eggs will escape. Then add the orange juice and the cranberries. Mix well. Pour the batter in the tin and bake @ 170'c using the lower heating rods/ coil for 60 mins approximately or until a skewer inserted in the centre of the cake comes out clean or with a few moist crumbs. Note that every oven works differently so keep an eye on the temperature and the duration of the bake. Earlier this week, I shared with you my Diwali Recipe Collection (take 1), but there were many recipes that still needed to be added. I wanted to avoid overcrowding one post and decided to do it in parts. To continue with Diwali frenzy and in my humble attempt to simplify things for everyone…I present to you my Diwali Recipe Collection (take 2). I will be putting up the entire step-by-step recipe here along with the direct link to each post at the end of each recipe. You can click that to see the step-by-step pictures in case you are interested 😊 Do read till the end and you will be deciding your menu right here!! Click here for a direct link to detailed recipe of Pooranpoli. 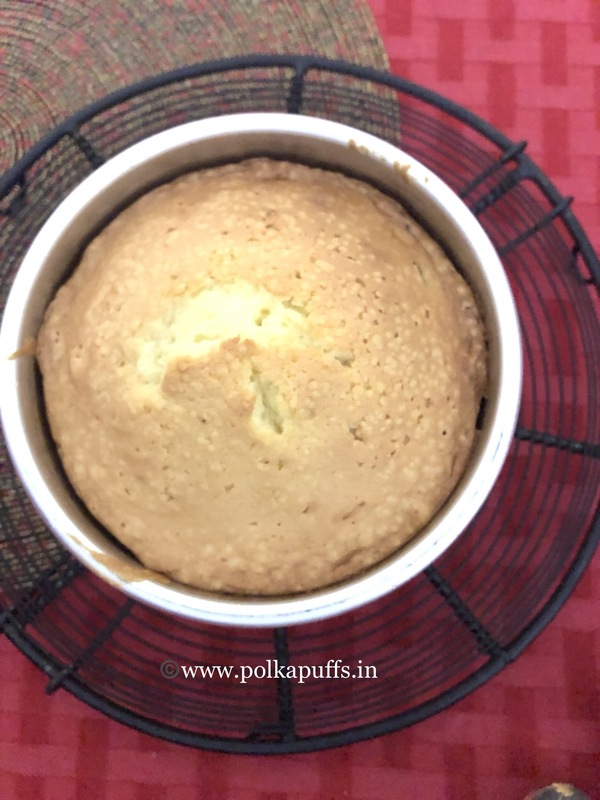 Click here for a direct link to detailed recipe of Pressure Cooker Sponge Rasgulla. Equipment: kitchen press, a wok, a slotted spatula, a mixing bowl, measuring cups/ spoons. Take besan in a mixing bowl, add all the spices and season with salt as well. Give it a mix. Add the oil and use lukewarm water to make a loose dough. The dough should be softer than that of roti (the dough should feel slightly sticky when u touch it, I used about 1/2 cup water). Let the dough rest for 30 mins. Heat sufficient oil in a wok for frying. Then, after resting it for 30 mins, fill the kitchen press with the dough and fit the plate with larger holes for thick Sev (see the pic above for reference). And slowly drop the dough into the hot oil from the press. These keep well for 10-15 days in an airtight container. Enjoy! CLick here for a direct link to detailed recipe of Masala Sev. Click here for a direct link to detailed recipe of Dahi Wadas. Equipment: a non stick pan, a wooden spoon, measuring cups/ spoons, a knife, a plate, a rolling pin. Use a blender and dry grind the cashews to a fine texture. Make sure the cashews were at room temperature before grinding. Heat the non stick pan, add the sugar & water. Melt the sugar into the water on a low flame. Keep stirring. Once the sugar has melted, cook for another 2-3 mins on low flame. To check if the sugar syrup is ready, take some water in a bowl and add a drop of the syrup. The drop should not mix in the water. This is one thread consistency (ek taar ki chashni). My syrup was ready in 5 mins approximately. Once the syrup is ready, add the cashew powder & keep stirring constantly & cook on low flame for 5 mins, until you achieve a dough like consistency. To check the consistency of the Katli dough, take some mixture in your hands and make a ball, if the shape holds, it’s ready. Remove this dough like mixture on a greased plate and let it cool for 5 min. Grease your palms and knead this mixture carefully until it’s smooth. Now, roll this dough with a rolling on the back of a greased plate. The thickness should be about 6mm or a bit more. Don’t roll it too thin. Set this plate in the refrigerator for 8-10 mins. They will set really quickly, once set, you can cut them in any shape as you prefer, however I prefer the traditional diamond shape for these katlis … That’s it! They are ready 😄 you can store them in an airtight container for 2-3 day in the refrigerator. Equipment: a large mixing bowl, a whisk (electric or manual), some cling wrap, a sharp knife, measuring cups/ spoons, baking tray, cooking rack. Take butter and sugar in a mixing bowl, cream them together until they are fluffy and light. Then add the tutti frutti, cashews & vanilla extract. Mix it these well then add the flour. Mix them well with a light hand and bring them together to make a ball. Use 1 tsp of milk only if you are unable to make a round ball. The dough doesn’t need to be kneaded, just bring it together. The mixture is very soft and pliable. Now, take the dough on some cling wrap and roll it well to give it the shape of a thick log. Wrap the log well and refrigerate for a minimum of 30-40 mins. In the meantime, preheat your oven @180’C for about 10 mins. Line your baking tray with some parchment/ butter paper. Remove the chilled log of dough from the refrigerator and cut it in about 1/2″ slices. Place them slightly apart on the lined baking tray. Bake them for 15 mins @180’C using the upper and lower rods for the first 10 mins, then just the lower rod for the last 5 mins. Remove the tray from the oven & let it cool on the rack for about 15 mins. The cookies are soft when you remove them from the oven but crisp up as they cool down. You can store these in airtight containers for almost 1 week. *Please note that baking time may vary as every oven is different, so time the oven accordingly. The cookies turn slightly golden around the edges as they are ready, so remove them from the oven as per the colour. Equipment: a heavy bottom wok, measuring cups & spoons, a wired whisk, baking/ parchment, paper or aluminium foil sheet, a sharp knife. Line the any container or a plate with the baking paper/ parchment paper/ aluminium foil. In a wok, add all the ingredients except the vanilla extract & chopped walnuts. Heat them on low flame and keep whisking simultaneously so that the mixture doesn’t burn or has any lumps. Keep cooking and stirring until the mixture comes together and form a thick mass that moves with the whisk. Add the vanilla extract & walnuts at this stage and mix well. Immediately pour the mixture on the prepared container or plate. Spread it with the help of a spatula. Keep it in the refrigerator to set for a minimum of 2 hours. Once set, slice it into bars or squares & serve. They last for 3-4 days under refrigeration. Click here for Diwali Recipe Collection (take 1). I won’t be placing direct links here for you to keep clicking, that can get a little tedious. I will be putting the link to each recipe with its step-by-step pictures at the end but not before I give you a detailed recipe right here on this post. That way, it’s up to you if you wish to check the pictures or not. I think that’s fair enough as you won’t have to navigate your way into my archives and spend to much time when you should actually be grabbing a recipe and heading to the kitchen 🤗😂 So, do read till end because each of you is going to end up making something from here…!!!!! Equipment: a heavy bottom pan, a wooden spatula, a tray, a knife, a seive, a mixing bowl, measuring cups/ spoons. Add a tsp of ghee in the pan and roast the besan for 3-4 mins, just until the rawness goes away and the besan releases a nutty aroma. Turn off the flame. Seive the roasted besan into the mixing bowl. Add the ghee into it and mix it with the besan to make a smooth paste. Keep that aside. Take water and sugar in the pan, set it on low flame and let the sugar melt completely. Keep stirring while the sugar melts. Alongside, grease the tray well with ghee. Set it aside. By this time the sugar syrup will be boiling away. The syrup will be very thick. Now add the besan and ghee paste into the melted sugar. Keep stirring continuously now onwards, keep the flame at the lowest setting. Also, add cardamom pwd & a couple of tsps of ghee into the boiling mixture. Once the mixture begins setting (it will set within 10 mins), cut the Mysore Pak in desired shapes and serve. Keeps well without refrigeration in an airtight box for upto 2 weeks as it contains good amount of ghee. Click here for a direct link to detailed recipe of Mysore Pak. Equipment: a heavy bottomed non-stick pan (I use non-stick, it’s easier to work with it), measuring cups/ spoons, a small pan. Rinse and soak the lentils (dal) in lukewarm water for 2-3 hours (I always use lukewarm water here as it ensured that the lentils are soaked well in less time). Once the lentils have soaked well, strain them. Blend them in a mixer without adding any water until smooth (I leave them a bit grainy as I mentioned above too). Set it aside. Heat ghee in the pan, once it melted, add the blended lentil paste and keep stirring on low flame for 15-20 mins. Do not cease stirring as the lentil paste will burn or colour unevenly. After 15-20 mins, the ghee will seperate from the lentils and the lentil paste will be a bit crumbly and golden in colour. Turn off the flame and set this aside. Now, add the sugar syrup to the cooked lentils and turn on the flame, keep it on low. Keep stirring it and let it come to a gentle boil. Cover with a lid and let the sugar syrup reduce and cook for 5-7 mins with the lentils. Open the lid, check the consistency and cook further if it’s still watery, else, add 1 tbsp of ghee and turn off the flame. Garnish with nuts of your choice or just pistachios like I have done here, best served warm. Or create a fusion by add a scoop of ice cream to the bowl! Equipment: a heavy bottomed wok, measuring cups/ spoons, a couple of plates, a spatula. Take grated Khoya in the wok and cook on low flame. Keep stirring it continuously until the khoya begins to melt. Add 1 teaspoon of ghee at this stage and some milk, about 2 teaspoons. Keep stirring continuously so that the Khoya gets an even colour and doesn’t burn at the bottom. It took me almost 25-30 mins to reach this stage. I added another two teaspoons of milk because the Khoya looked dry. Add milk as per the texture. Always cook on low flame else the Khoya will colour unevenly. Turn off the flame (I didn’t cook it any further to make it a little more brown, my arms were hurting too much after stirring constantly). Add cardamom pwd and mix well. Let this mixture cool down for just 5-6 mins and add the castor sugar. And mix with your hands to incorporate the sugar. (TIP: Don’t let the mixture cool off too much before adding the sugar as the sugar won’t melt properly. But in case the khoya has become too cold and the sugar isn’t melting properly, you can cook the khoya & sugar mixture for 3-4 mins on low flame and immediately take it out of the pan and mix well). Once the mixture is ready, grease your palms with some ghee and make Pedas of any shape (I kept them rustic) and roll them in some castor sugar. And set them aside. These can be stored for more than a week even without refrigeration as they have been cooked so well. That’s it! Click here for a direct to detailed recipe of Mathura Ke Pede. Equipment: a large wok, rolling pin, rolling board, a knife, a mixing bowl, a slotted spatula, measuring cups/ spoons. Take all the dry ingredients in a mixing bowl, add warm ghee. Now rub these ingredients together for 10-15 mins, they should resemble breadcrumb like texture. This will make the mathris Khasti. Once that’s done, add water little by little to make stiff dough. Knead the dough for a few mins, cover it & set it aside for 15 mins (since I was in a rush today, I did not follow this step but still managed to get Khasti Mathri). After 15 mins, knead the dough again for 2 mins. Then divide the dough to make equal sized balls. Using a rolling pin, roll them to a thickness of 1/2″ and prick them all over with a knife on both sides. Repeat this step for the entire batch of dough. Next, heat sufficient oil a wok to fry. Once the oil is hot enough, reduce the flame to low and start frying 2-3 mathris at a time. Do not fry on high flame, the mathris won’t crisp up & will be raw from inside as well. Once they turn golden brown on both sides, remove from the oil & drain on kitchen tissues. Repeat for the entire batch of the rolled mathris. Cool them completely before storing in air tight containers. They keep well for 8-10 days. Click here for a direct link to detailed recipe of Khasti Mathri. Equipment: measurging cups/ spoons, a large wok, a slotted ladle, a chakli press/ kitchen press, some kitchen tissues. Seive rice flour in a large mixing bowl, add salt black pepper, soda bicarb and ghee. Keep rubbing these together until the flour resembles a bread crumb like texture and it holds it’s shape when held in a fist (I do it for about 20 mins to get a crisp texture later). Then using little water make a hard dough. Cover the dough and let it rest for 15 mins. Next, fill the dough in the kitchen and use the plate shown in the second picture above to make the shapes of the namak paare (as the dough is glutenfree, I wasn’t comfortable rolling it and cutting it into small diamonds, you can do so if you are able to manage to roll the dough). Heat sufficient oil in a wok, once it’s hot, turn the flame to low. Now drop the pressed pieces of dough into the oil and fry on both sides. Remember to fry on low flame so that they cook evenly and turn crisp. Once done, remove from the oil and place on kitchen tissue to absorb excess oil. Let them cool off completely before storing them in airtight containers. Click here for a direct link to detailed recipe of Chawal ke Namak Paare. Click here for a direct link to detailed recipe of KHOYA Peda. 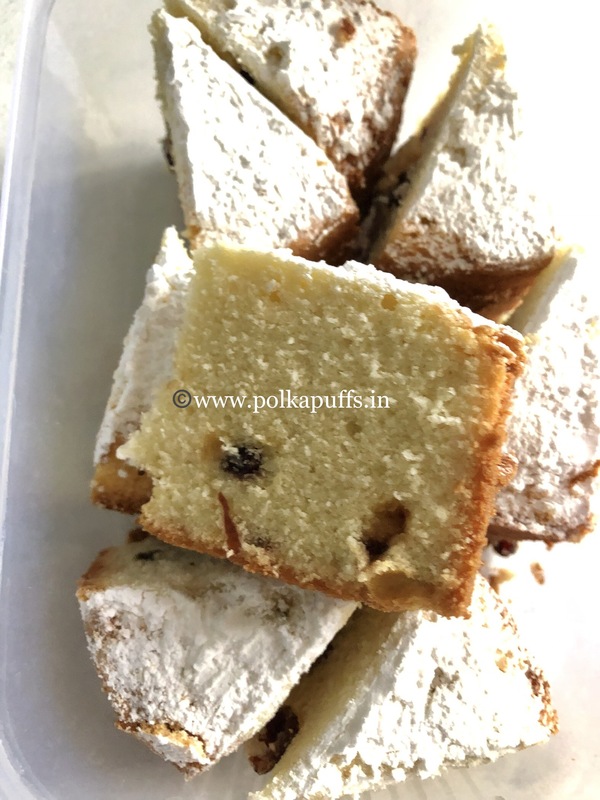 Click here for a direct link to detailed recipe of Instant Kesar Peda. Equipment: a kitchen press (chakli maker), a mixing bowl, a saucepan, a slotted spatula, a large wok, measuring cups/ spoons. Boil 1 cup of water in the saucepan, then add rava and cook it, make sure it is without any lumps. Now, add rice flour, besan , salt to taste, kala namak, red chilli pwd, roasted cumin pwd, cumin seeds, hing and 1 tbsp hot oil to the cooked rava. Give them a mix. Add a little water and make a soft dough. Let the dough rest for 15 mins. Then, make the Chaklis using the chakli maker on a plate or aluminium sheet. Heat sufficient oil in the wok. Once it’s hot enough, lower the flame and start frying the chaklis on medium flame. Don’t fry on very high flame, else they will remain raw from inside. Fry 3-4 chaklis at a time, don’t overcrowd the wok. Let them turn golden- brown in colour on both sides & drain them on kitchen tissues. Store them in airtight containers, they stay fresh for 8-10 days. Click here for a direct link to detailed recipe of Chakli | Rawa Murukku. Equipment: a non stick pan, a wire whisk, measuring cups/ spoons, a tray, a sharp knife, a mixing bowl, a wooden spoon. In a mixing bowl, add the cornflour/ custard powder + 1+1/2 cups of water. Also add the colour and whisk these well. Ensure there are no lumps in the mixture. Set it aside. Next, in the non stick pan, add the sugar & 1 cup of water. Turn on the heat and these melt together. Stir it with a wooden spoon a couple of times. This needs to be done on medium flame. There is no need to get any thread consistency here. Just that the sugar must melt completely and the mixture should be bubbly and frothy. It must thicken slightly and be sticky. 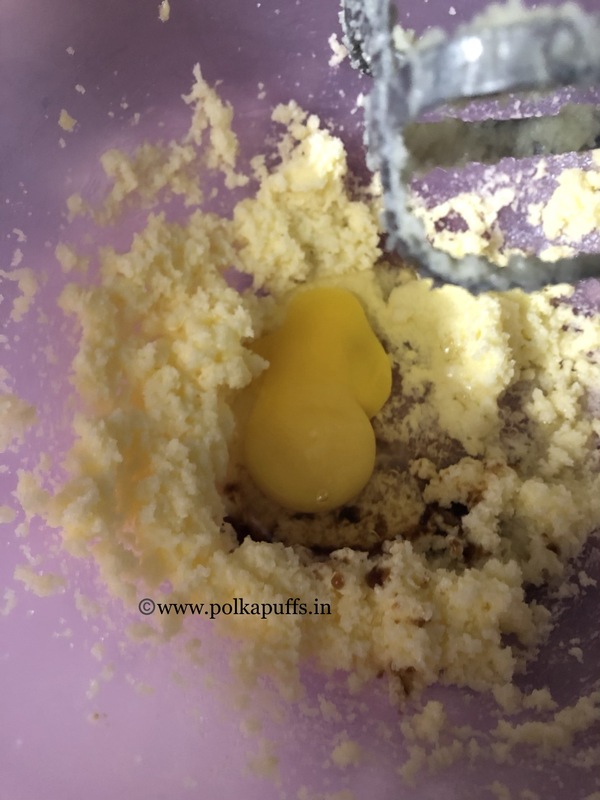 Once such a texture is achieved, stir in the cornflour/ custard powder and water mixture in the sugar syrup while stirring all the time so that there are no lumps. In 3-4 mins, you will see that the mixture has started to thicken and has turned glossy in certain parts. Keep stirring continuously. Now, add the elaichi pwd and the ghee too. Keep stirring and mixing everything together. The texture will thicken more at this stage and become gluey. It will take another 5-6 mins for this. You will see the mixture slowly leaving the sides of the pan. Keep stirring without stopping as this stage is crucial and if you don’t stir, you will end up with lumps all over. Now add the chopped cashews (you can fry and add these, I didn’t fry it). Mix in the cashews quickly. Now you will see that the mixture is beginning to set if you stop stirring it. Immediately pour the mixture on the greased tray and flatten it out a little bit. Garnish it with some slivers of pistachio. And let it set for at least an hour, at room temperature for the first 20 mins and then in the refrigerator. Once it’s set, use a sharp knife and cut it in any desired shapes. That’s it, it is ready😀 it keeps well in fridge for about 5-6 days. Click here for a direct link to detailed recipe of KARACHI HALWA. Equipment: a rolling board, rolling pin, a knife, measuring cups/ spoons, 2 heavy bottomed wok, a slotted spatula, kitchen tissues, mixing bowl. In a mixing bowl, seive maida (APF). Add salt, rawa, baking soda and ghee. Rub these together until the texture of the flour resembles to that of bread crumbs. This step is crucial as it ensures the crispness of the shakarpara. I rub these ingredients together for almost 20-25 mins. Next, take very little water to knead a stiff dough. Cover the dough with a napkin and let it rest for 15 mins. Divide the dough into 4 equal parts and roll them on a board to a thickeness of 6mm or so. Using a knife cut into small diamond shape pieces. Set them on a plate. Heat oil in a wok, once it’s hot, lower the flame to minimum and fry the pieces until golden. Keep moving the pieces around in the oil so that they get a golden colour and cook evenly. Cooking on low flame ensures that they are crisp. Fry the entire batch and keep it on kitchen tissues to absorb any extra oil. Let them cool down completely. They will crisp up as they cool down. In a wok, take water and sugar. Heat these on medium flame while stirring continuously. The sugar will start melting and also will become very thick. Keep stirring and once the sugar starts settling like a white powder around the wok, add the fried pieces of Maida (APF). Mix everything together quickly to coat the fried pieces with the sugar. Be quick as the sugar will dry and set within 5 mins. Let them cool completely before storing in airtight boxes. 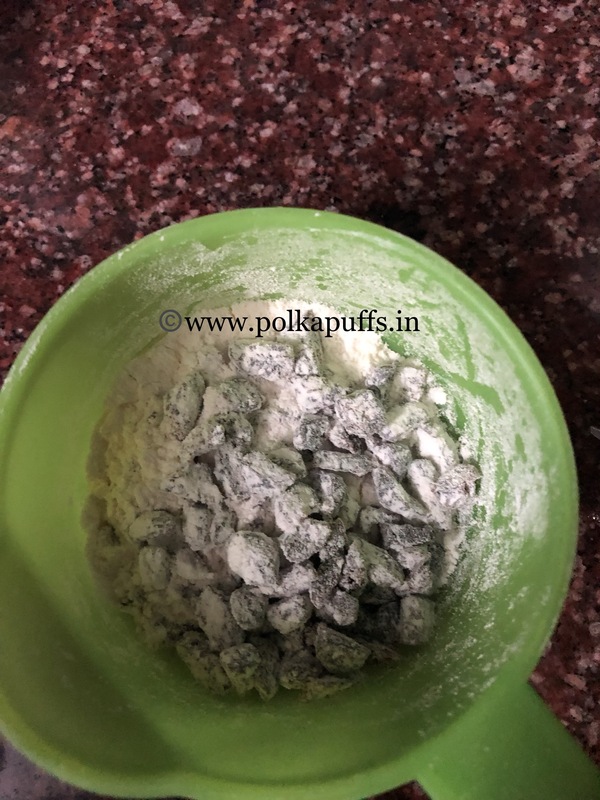 Click here for a direct link to detailed recipe of Shakarpara. Equipment: a non-stick wok/pan, measuring cups/ spoons, a spatula. Heat ghee in a nonstick wok, add the Rava and roast it until it becomes slightly golden, it takes about 5-6 mins on medium flame. Then add the desiccated coconut into the roasted rava, further roast them together for 5 mins. Then add cardamom pwd (optional) & the condensed milk. Mix everything well on low flame and cook for about 5 mins, you will then see the mixture coming together like a thick dough. Turn off the flame. Let the dough cool down for 10 mins. Grease your palms with some ghee and make laddoos with the dough. Keep the laddoos in the fridge for 15 mins. Then remove them from the fridge and re-shape them so that they are nice and round. That’s it! Done😉 they keep well for 4-5 days even without refrigeration. Enjoy! Click here for a direct link to detailed recipe of Instant Rawa Laddoo. 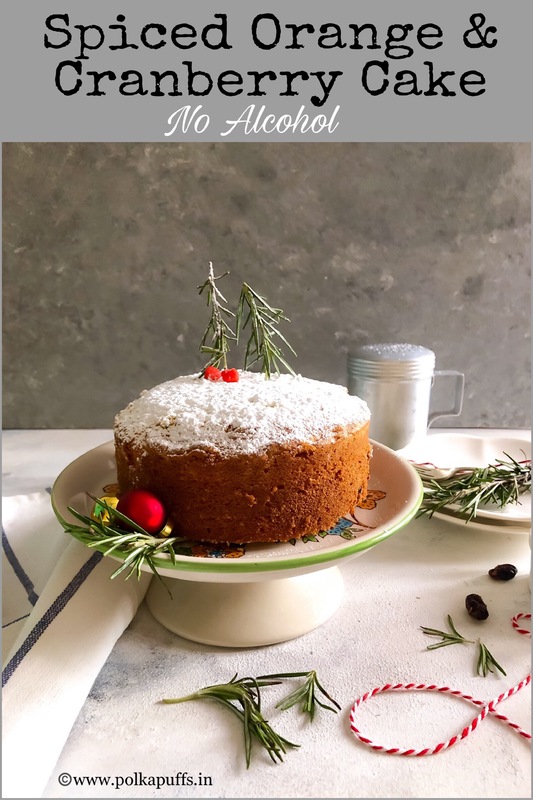 I am sure you’ll these recipes and try them too😊 My blog has many more recipes for sweets and savouries too, you can check them out in the search bar or in the archives column on the right hand side. I can’t imagine a Diwali without any Khurma (as we call it up North) or Shakarpara (little chunks of pastry dough flash fried and turned crisp, then cooled and dunked into a thick sugar syrup…to make these melt in the mouth sweet bites! )….I am sure your are salivating as you read the description 😜😁 each of these little bite sized yummies are super crisp and taste out of the world….pop one into your mouth and your in food heaven! Don’t they look so pretty…every single one of them looks like a gold nugget to me 😍!! Lol! The flavour is amazing too….it’s very hard to resist them. I remember eating them by the bowls as a kid when my Mom used to make these during Diwali or even during summer vacations as a quick snack. They’d disappear within days…hardly leaving any to be gifted to friends and family. Anyways…I will share some tips and tricks here with you how to make perfect, crispy and delicious Shakarpara/ Khurma. Hope you try them soon. Also, check out Khasti Mathri recipe here. Although, these are fried…rice flour on its own absorbs very little to almost no oil and stays crisp for at least 3-4 days. I am hooked! If you are looking for more ideas for savory treats this Diwali, click here for crispy Rawa Chakli recipe, click here for Masala Sev recipe, click here for Khasti Mathri recipe.